Cardiff City defender John Brayford played 20 games for Sheffield United while on loan in the 2013-14 season. Cardiff City boss Russell Slade says John Brayford is in talks with Sheffield United as their bid for the full-back reached "the right level". The Blades are thought to have made two bids, the second believed to be more than £1.5m. 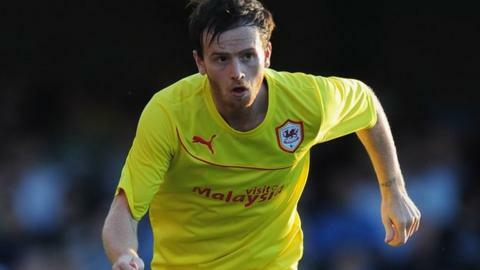 Slade also said striker Adam Le Fondre could be loaned out less than a season after joining from Reading. Meanwhile, a deal to bring Huddersfield defender Lee Peltier to Cardiff is at "a sensitive stage", said Slade. Brayford spent the second half of the 2013-14 season on loan with the Blades, but has been a key member of Slade's team since he took charge in October 2014. Previous Bluebirds manager Ole Gunnar Solskjaer signed Le Fondre in May 2014, but the former Reading man has scored just three goals in 25 appearances for Cardiff. Peltier has been in talks with Cardiff since Tuesday, with a transfer set to be completed on Friday.